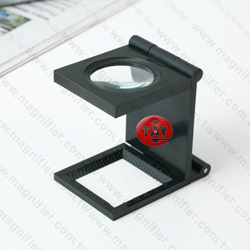 Plastic linen tester, folder magnifier. 1. Linen tester with fixed focus 6x magnification. 2. Size: 25mm. 3. Lens: acrylic lens. 4. Frame: plastic material. 5. lens construction for increased clarity and minimal line distortion at the edge of the viewing area. 6. Economical and light they feature with Optical lens and a lateral mill metric scale. 7. Packing: each piece in a PVC bag, PU pouch or velvet pouch.